4.1 out of 5 based on 329 bloggers and 107 commenters. 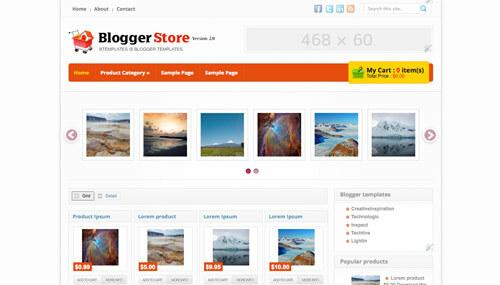 Blogger Store is a free premium blogger template with 2 columns, right sidebar, gallery-styled, web 2.0 design, fresh look, rounded corners, an exclusive design for Blogger, ads ready, slider and social bookmarking icons. Excellent template for blogs about business, photography or an online store. Hi. i have problem with my thumbnail slider. It’s no appear in my homepage and have no problem with other pages and posts. ¿Como se puede cambiar la divisa a la hora de pagar en paypal? u all can follow this step. 3)in the tab file, click send to dekstop. 4)open ur blog,template,upload browse to dekstop that we put the xml doc. Thanks alot for the template. May god bless you to create such good designs. Hey, can you tell me how to edit header where it is written product category, sample, sample. I want to edit them, but I am unable to do so. Please reply soon. Alguem sabe como faz para colocar pt_BR? BRL para receber no paypal? Depois que tiver feito upload vá em modelo e procure simple cart. ola amigo tens como me dar uma ajuda para publicar meus produtos. não estou conseguindo inserir os códigos corretamente. maTUR thank U,, Bagus banget buat pemula. I am using your template, but unfortunately, the pictures were out of the box and I can erease the header (sample pages, home, etc). Should I modify the template code? iyo.. piye carane ngedit chart ? Hello I am trying to fix the options in the paypal paying area as well as being able to add coupons codes. Mau tanya cara ganti product category-nya gimana ya? How to change the product category item? I’m having trouble with the Prize of product. I’m having trouble with setting up the product price. Please tell me how to set up the price of a product…. wah keren nih tamplatenya thanks ya. Thanks U very much, i try.. Thanks U very much, akan saya coba. I had done dowload file code in btemplate. however, it is iror in setup template for my blog. Can you suport edit iror or sent file code final to my email. I’ve downloaded the template but my post was outside the box. How will i make it? Thank you Very much, The template is really really cool.